While code-excited linear prediction shows good performance for bitrates above 8 kbits/s, the quality of the speech-specific waveform coding scheme drops noticeably at lower rates. At such low rates, all information included in the waveform of the speech cannot be correctly coded. On the other hand, parametric speech coders also called vocoders concentrate only on key perceptual features of speech, rather than the entire waveform. By encoding parameters of a linear model of speech, speech parametric coding can reach rates of 4 kbits/s down to 0.5 kbits/s, thought the quality is often qualified as synthetic. 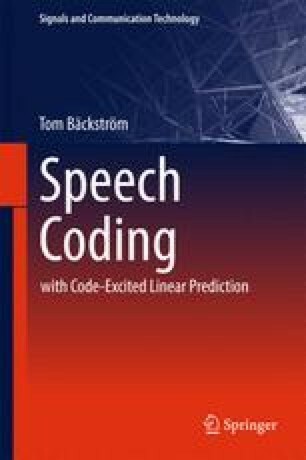 The relaxed code-excited linear prediction (RCELP) is a way of extending the code-excited linear prediction coding scheme towards low rates by keeping a natural speech quality. RCELP uses the generalised analysis-by-synthesis paradigm, which relaxes the waveform-matching constraints without affecting speech quality. The basic principle is to ease the encoding of the signal by modifying appropriately the input signal.